Wholesale Personalized Bottled Water Custom Printed in Full Color. Promotional, Inexpensive. Lowest prices in America. 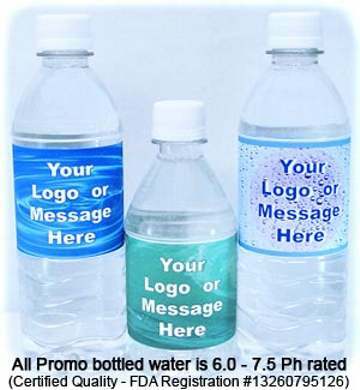 Bulk discount Bottled Water of different sizes with full color, high quality custom labels. Free artwork design. We will send you a proof for your approval before production. Lowest prices in USA for personalized bottled water. American clients pay no taxes. Setup Charge: $98.00 per order for up to Full Color imprint; no Setup Charge for repeat orders. Shipping: we ship from 6 different warehouses from all over the USA, and our shipping costs are exceptionally low: please ask for a quote. Capacity: 12 oz. and 16.9 oz. Sturdy 19g bottles (not paper thin). Print Area: 16.9 oz: 6" x 2". 12 oz: 6.375" x 1.625". Up to Full Color imprint. Shipping: we ship from 8 different warehouses from all over USA, hence our shipping costs are very low: please ask for a quote. Production Time: 8-10 working days after art approval; contact us for faster production.